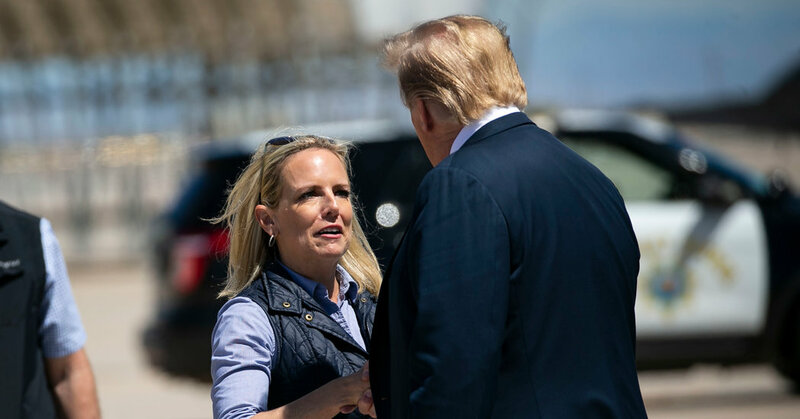 WASHINGTON — Kirstjen Nielsen, the homeland security secretary, is leaving her position, President Trump announced on Sunday, ending a tumultuous tenure in charge of the border security agency that had at times made her the target of the president’s criticism. The move comes just two days after Mr. Trump, who has repeatedly expressed anger at a rise in migrants at the southwestern border, withdrew his nominee to run Immigration and Customs Enforcement because he wanted the agency to go in a “tougher” direction. The president said in a tweet that Kevin McAleenan, the commissioner of Customs and Border Protection, will take over as the acting replacement for Ms. Nielsen, who took over the agency in late 2017. She was long expected to be fired as Mr. Trump’s dissatisfaction grew over an increase of migrants illegally entering the United States at the southwestern border. Last May — six months after taking over at the department — The New York Times reported that Ms. Nielsen had drafted a resignation letter after being berated for what the president called her failure to help stop illegal immigration. Mr. Trump and Stephen Miller, his top immigration adviser, have privately but regularly complained about Ms. Nielsen. They blamed her for a rise in migrants entering the United States and not finding more creative ways to secure the border. She also lost a powerful protector when John F. Kelly, her mentor, left his job as White House chief of staff at the beginning of the year. Mr. Kelly was the Trump administration’s first homeland security secretary and lobbied for Ms. Nielsen to replace him. Multiple White House officials said she had grown deeply paranoid in recent months, after numerous stories about her job being on the line. She also had supported the ICE nominee Mr. Trump withdrew, Ronald D. Vitiello, and her support for him was described as problematic for her with the president. So was her recent trip overseas as the border situation engulfed news accounts. Mr. Trump enjoyed Ms. Nielsen’s television appearances, administration aides said. But despite several stories about how much better her relationship with Mr. Trump was, Ms. Nielsen never learned how to manage him, people familiar with their discussions said. He often felt lectured to by Ms. Nielsen, the people familiar with the discussions said.